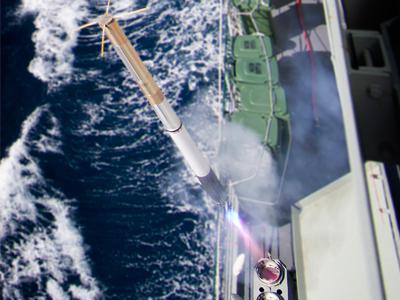 HMAS Darwin conducts a Nulka Active Missile Decoy firing in the Eastern Australian Exercise Area, as part of pre-deployment checks during the ships Mission Readiness Evaluation. Minister for Defence Senator David Johnston today announced the Government has given First Pass approval to update the Nulka Active Missile Decoy launch capability under project SEA 1397 Phase 5B. Nulka is a sophisticated anti ship missile defence system, jointly developed by Australia [through DSTO] and the United States during the 1990s, and today is in service with the Royal Australian Navy (RAN) and the navies of the United States and Canada. By 2019, the Nulka system will be fitted to 166 ships worldwide, including protecting United States aircraft carriers. “I am pleased to be able to announce that the Government has approved First Pass for SEA 1397 Phase 5B – Nulka launch sub-system upgrade, including around $45 million in funding,” Senator Johnston said. The existing fire control and launcher sub systems were introduced into service in 1997, and have obsolescence and sustainment issues. This project will update the launch system with newer technology and also enhance its effectiveness. When finalised, the updated system will be installed into the RAN’s ANZAC Class Frigates and Hobart Class Destroyers. Work will also be undertaken to fit Nulka to the Canberra Class Amphibious Ships. Overall this program will contribute to the protection of these ships against anti ship missiles well into the future. The total cost of SEA 1397 Phase 5B is $100 - $300 million (middle of the band). Defence will now commence First to Second Pass activities, which include engineering design and risk reduction activities. Initial development of the updated launch system is proposed to be conducted by BAE Systems Australia, the original equipment manufacturer of the Nulka capability, however there may be opportunities for wider Australian industry involvement as the project progresses. The Government expects to make a decision on the final launch sub system capability in 2017. The upgraded capability is expected to be introduced into operational service from around 2020.